This groundbreaking merger of reality comes straight from the business pages. 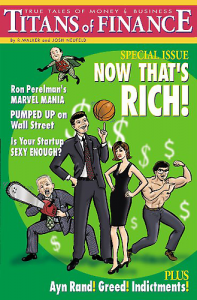 Meet Ron Perelman, the man who made millions while presiding over the Mighty Marvel Comics train wreck. Thrill to the antics of “Chainsaw” Al Dunlap, Mike “The V-Man” Vranos, and “Jaybird” Goldinger — and many more of Wall Street’s most well-known Icaruses. These aren’t just instructive episodes about the current climate. They’re timeless tales, like the Bible or Cats. Never mind Spawn and Spider-man. These are our superheroes now. These tales “hit the mark,” says Harvey Pekar, and are “a brilliant use of the medium,” according to TheStreet.com’s James J. Cramer. Best of all, it’s all true! Titans of Finance is entirely based on press accounts. The results are mind-blowing. Over the past five years, in fact, Titans has crushed the benchmark S&P 500. You’ve never seen anything like it — this is one acquisition you won’t regret. Featuring the crisp art of Josh Neufeld (co-creator of Keyhole), and the incisive scripts of journalist Rob Walker.